By Kamran Zamanian, Ph.D, and Andrew Bieg, iData Research Inc. Chronic sinusitis is a highly prevalent condition, with approximately 12.5 percent of the American population affected annually. It is categorized by an inflammation of the sinuses lasting more than 12 weeks, with symptoms ranging from nasal congestion to maxillofacial pain. Although chronic sinusitis cases can be subdivided into those with polyps or without, all cases are associated with impaired sinus drainage and secondary bacterial infections. Although the risks of FESS are minimal, some patients have expressed an aversion to surgical procedures or are unsuitable for FESS treatment due to adverse reactions to anesthesia. Until recently, these patients were left attempting to cope with their sinusitis through nasal saline irrigation, oral glucocorticoids or antibiotics – none of which perform the same function as a FESS. Approximately 552,000 patients undergo FESS procedures annually in the United States.7 Of these, over 50 percent are well-suited for balloon sinus dilation, and an additional 30 percent are suited for hybrid balloon sinus dilation (BSD with FESS). In addition to these patients are individuals who are unsuitable for FESS. This suggests a massive treatment market. Due to this potential for growth, the BSD segment is expected to represent over 40 percent of the entire ENT device market by 2022. The strength of BSD devices lies in their minimally invasive nature. Patients are increasingly eager to undergo treatments that will alleviate their symptoms while minimizing down time. This trend has been present in the laparoscopy market since the early 1980s, and has been recorded in the prostatectomy market at a 2013 conversion rate of approximately 90 percent to MIS procedures.8 Due to this, the demand for BSD devices is expected to remain strong throughout the foreseeable future. The ENT industry is rapidly realizing the market demand for BSD. This has resulted in the creation of interrelated devices and increased market competition.9 Since 2011, IntersectENT has been the sole producer of drug-eluting sinus stents for post-FESS. Recently, they applied for FDA approval of a post-BSD device. 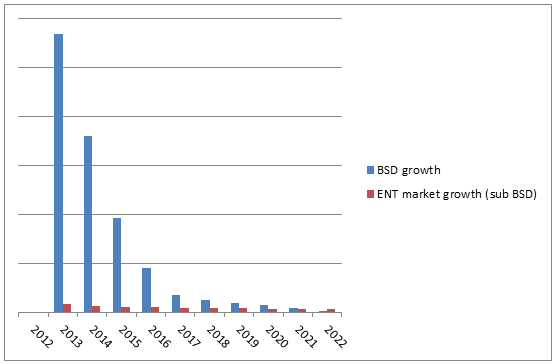 Similarly, the increasing interest of medical super companies in the BSD market is widespread. Acclarent, the original BSD device developer, was acquired by medical super power Johnson & Johnson in 2010.10 Additionally, both Medtronic and Smith & Nephew now provide competing BSD devices. Despite the marketing and sales power of these companies, the current second-largest market share holder is Entellus, a company with $60 million in annual earnings.11 In the immediate future, increasing market competition is expected to occur. Companies that desire to offer full ENT device portfolios cannot avoid acquiring a BSD device. Differentiating factors within this industry are expected to be the ability to pair BSD devices with powered shavers, image guidance systems, and post-BSD devices. Although some BSD patients will be those who were unsuitable for FESS, many will be individuals who would have received FESS in the past. The major impact of this development is expected to occur in the powered shaver market. As FESS procedures represent a large portion of powered instrumentation use, decreases in the market value of this segment can be expected in the future. In particular, decreased demand will drive powered shaver instrumentation average sales prices (ASPs) down to a very low rate. 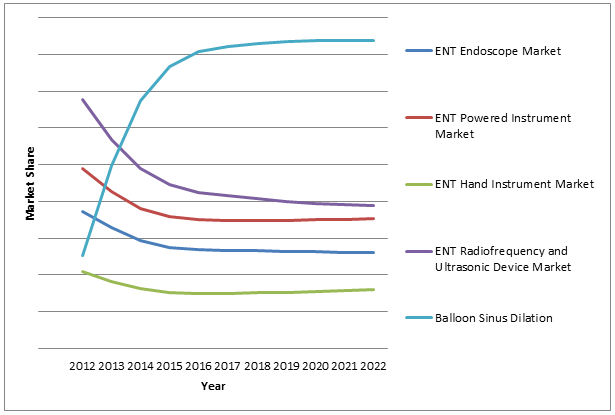 Additionally, devices to be used in conjunction with BSD devices, such as drug-eluting stents, will continue to improve and grow the balloon sinus dilation market. The information in this article was taken from a report suite, published by iData Research, entitled the U.S. Market Report Suite for ENT and Bronchoscopic Devices. The suite covers reports on the following markets: ENT Endoscopes, ENT Powered Instruments, ENT Hand Instruments, ENT Radiofrequency Devices, Balloon Sinus Dilation Devices, Bronchoscopes, Bronchoscope Hand Instruments, Bronchial Stents, Bronchial Forceps, Transbronchial Aspiration Needles, and Foreign Body Removal Devices. Andrew Bieg is a research analyst at iData Research and was the lead researcher for the 2016 U.S. ENT report. He is currently working on a report on the U.S. urological devices market, scheduled for release early in 2016. British Academic Conference in Otolaryngology and the British Association of Otorhinolaryngology amalgamation. Accessed Nov. 17, 2015. US Market for ENT and Bronchoscopic Devices Report Suite – 2016, iData Research Inc.